What do you think is the best selling beer in Germany? Bitburger? Becks? Hofbrau? Paulaner? No, to all of those. 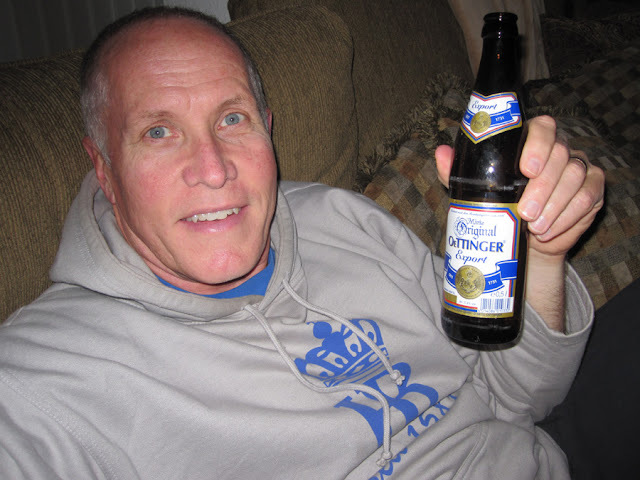 The best selling beer in Germany is Oettinger. And, with that, most of you will almost certainly be saying who are they? Well, Oettinger Brewery has been producing beer since 1731 and has been the top selling beer here in Germany since 2004. Their headquarters are located in Oettingen in Bayern just south of Rothenburg and very near Dinklesbuhl. Oettinger brews 23 different types of beer; everything from a Pilsner to a Strawberry Weizen beer. Oettinger does not advertise. They have no middle-man delivery service, using only their own delivery trucks. They have a plain gold bottle cap; no fancy painted design. They also have highly automated breweries requiring only a few employees. In 2008 Oettinger produced over 174 million gallons of beer. (Compare that to Anheuser-Busch beer production in that same year of 11.1 Billion gallons.) Aah, but which beer is better? Really, need you ask? And to prove that point, not surprisingly, we have some OETTINGER. Tasty!! Beer in Low fly 7? I knew that because it was part of our Oktoberfest guide book! It's so much fun learning new things.